Take a look back at the combat bots from 2017. October 13 from 6:30 - 8 p.m. IMPORTANT UPDATES FOR COMBAT BOT TEAMS! 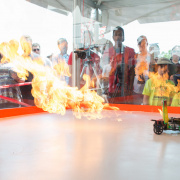 If your robot uses a flame effect, you MUST contact avc@sparkfun.com before arriving. There will be a designated pit table and some extra safety steps required. There is also a chance we will have to disallow flame effects at the event. We are still working with the fire marshal to get final approval. ALL COMBAT BOTS TEAMS ARE REQUIRED TO BE ON SITE BOTH COMPETITION DAYS unless you have been previously eliminated from the competition. If this is a problem for your team, please contact avc@sparkfun.com and we will do everything we can to accommodate. Only registered team members will receive Maker Faire Denver wristbands and be able to access the site. The wristbands are for Saturday and Sunday only, there is no need for a Friday wristband or ticket, but you must be a registered competitor to access the site on Friday. During the designated Team Check In times on Friday (12 p.m. - 8 p.m. for Classic AVC and 3 p.m. - 8 p.m. for Combat Bots), Saturday (8 a.m. - 9 a.m.) and Sunday (8 a.m. - 9 a.m.), please drive your car to the SparkFun AVC 2017 Team Check In tent located in the northwest corner of the Denver Mart facility. Our AVC entrance greeter will direct ALL competitors into the correct traffic lane for team registration, load in, and parking. If you arrive outside designated competitor load-in times, you will likely be charged a $5 parking fee. Once in the pits, your vehicle will be inspected by our competition judges on site for rules compliance. The process for loading your gear into your cars will be the same. Please drive your cars to the loading area once all spectators and attendees have left the premises and we have gotten the go-ahead from Maker Faire Denver. All adults must sign waivers during the check in process. For student teams or teams with participants under 18 years of age, please download the waiver and bring a copy signed by the participant’s parent or guardian. Waivers are mandatory and a cause for participant disqualification if signed copies are not provided to SparkFun. Competitor Preview Day: October 13, 2017, from 12 p.m. - 8 p.m.
All competitors are encouraged to check in on Friday ahead of Saturday and Sunday’s competitions in order to speed up the vehicle inspection process and get a chance to test your vehicles on the Classic AVC Course. Classic AVC pit areas will be available to competitors to unload your gear. There will be overnight security, but neither SparkFun nor Maker Faire Denver is responsible for any lost or stolen items. Please plan your time during the preview day carefully as we will not be able to allow any teams onto the course prior to 12 p.m. and after 8 p.m. Team Check In: 8 a.m. - 9 a.m.
All teams must be checked in and in the pits by 9 a.m. Classic AVC teams are only asked to compete one day. Race Heats: 10 a.m. - 5 p.m. Points will be allocated to vehicles as outlined in the competition rules in the outside space at the Denver Mart facility. The winner will be determined after Competition Day 2 and announced on avc.sparkfun.com and contacted to accept the prize or award. All teams must be off site by 6 p.m.
Any Classic AVC teams that have not already checked in on either Friday or Saturday must be checked in and in the pits by 9 a.m. Competitor Preview Day: Friday, October 13, 2017, from 3 p.m. - 8 p.m.
All competitors are encouraged to check in on Friday ahead of Saturday and Sunday’s competitions in order to speed up the bot inspection process. The Antweight arena and Beetleweight arena will be set up and ready for tech inspections. The large arena may still be unfinished at this time, but we may do inspections for Hobbyweight and Featherweight robots in the Beetleweight arena. Combat pits area will be available to competitors to unload your gear. There will be overnight security, but neither SparkFun nor Maker Faire Denver is responsible for any lost or stolen items. Please plan your time during the preview day carefully, as we will not be able to allow any teams to check in prior to 3 p.m. and after 8 p.m.
All teams must be checked in and in the pits by 9 a.m. All bots teams must be present both days for the bracket-style competition unless you have been eliminated from the competition. Final Safety Inspections: 8 a.m. - 10 a.m.
All teams and robots must complete safety inspections before competing. 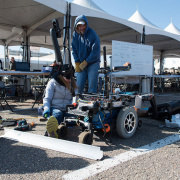 If you do not complete an inspection Friday, you must come in on Saturday morning; 10:30 a.m. is when the brackets are generated and no more bots will be allowed. We will hold a safety briefing to go over the rules, procedures and safety culture of the event. It is important to be here and understand the safety protocols. We must maintain a safe competition for builders and spectators. Repeated safety violations may result in disqualification and removal from the competition. Fight Heats: 11 a.m. - 5 p.m.
Day one has an aggressive schedule to ensure we complete the entire brackets in the allotted time. We will be running brackets all day. There is a chance we may need to run later than 5 p.m. to keep the tournament on schedule. Please be prepared for charging and repairing your robot in as little as 30 minutes. We will likely finish the plastic ant division on Saturday. Flight Heats: 9 a.m. - 4 p.m.
Competition brackets will continue. Please be prepared for charging and repairing your robot in as little as 30 minutes. It is important to be near the pit area as we get later in the brackets. First place winners in each of the eight competition categories receive a LulzBot Mini 3D printer for their school. First place winners in each of the eight competition categories receive a LulzBot Mini 3D printer for their school or club. First place winners in each of the eight competition categories receive $500 and a $250 gift card to SparkFun. Engineers' Choice, sponsored by Digi-Key: This award goes to the team with the most innovative solution to the challenges posed by the Classic AVC competition of their choice. The award incorporates aspects of the winning team’s solution like vehicle design, navigation techniques, performance on the track and sportsmanlike conduct. The winners will receive a Digi-Key InstaLab tool set, valued at approximately $2,000 retail. Only adult teams eligible. 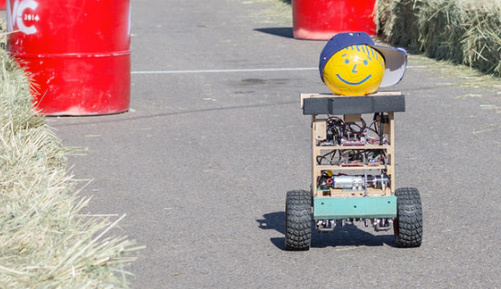 Crowd Pleaser, sponsored by Digi-Key: The winner of this award goes to the vehicle or robot that put on the best show for spectators, whether that involves superior navigation or superior entertainment value. The award will be decided on by the competition judges. The winner of this award will receive a Playstation 4 Virtual Reality setup, including a console, racing equipment and select games valued at approximately $1,500 retail. Only adult teams eligible. Upcycle Award: This special award goes to the team that uses the most recycled products in their vehicle build and demonstrates sustainable build techniques. The winner will receive a $100 gift card to SparkFun Electronics. 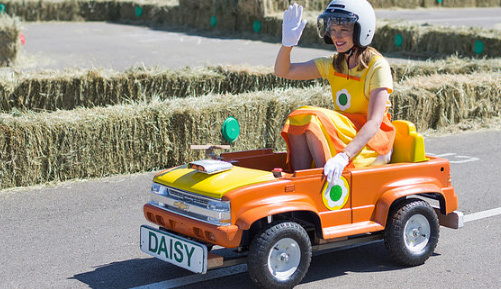 Flair Award: This special award goes to the most flamboyant vehicle designed and decorated to stand out in the crowd. The winner will receive a $100 gift card to SparkFun Electronics. Be prepared for several surprise special awards on competition day! You never know; you might be a winner! It’s the new age of transportation, and you don’t drive so much anymore; you’re just a leaf in the wind. Your job is to create a vehicle that will transport you safely to your working destination without accident and without any input from you. Armed only with a Nerf gun and a Grande Latte, can you get there in time? You’ve got a big presentation this morning. 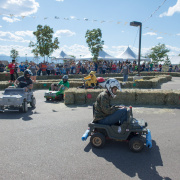 Competing vehicles will be expected to complete a course littered with obstacles within a set time frame without human interaction. The track is a figure-8 layout with a major axis length of approximately 178 feet and a minor axis of approximately 78 feet. While Google, Tesla and Uber are getting all the news coverage for driverless passenger vehicles, companies like Daimler have been building autonomous and semi-autonomous freight trucks for transporting cargo. The Logistics Class attempts to mimic the engineering hurdles seen in the in-warehouse transportation of goods as well as self-driving freight vehicles. It's robot fighting time! This will be our third year running Combat Robots. To keep things easy we are continuing to follow the rules set forth by the SPARC organization. These weight classes constitute the largest fighting robot competition in the Rocky Mountain region. Both weight classes will be competing in a newly refurbished 16’x16’ arena. Our classic beetleweight bot competition will be coming back this year to fight in a new 8’x8’ arena. 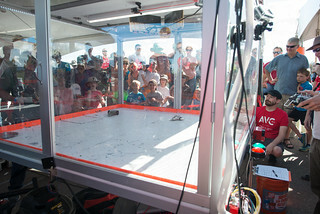 These small robots will fight each other in the old SparkFun 6’x6’ arena. The Plastic Ant division is primarily designed for K–12 student teams who will rely on 3D-printed and mostly plastic components for their builds. Plastic Ant rules can be found here. Each robot or vehicle registration will cost $35. Unlike in previous years, we only ask for the name of the team captain at the time of registration. When we send out our scheduling survey in late August to all team captains, we will ask for the names of all team members. 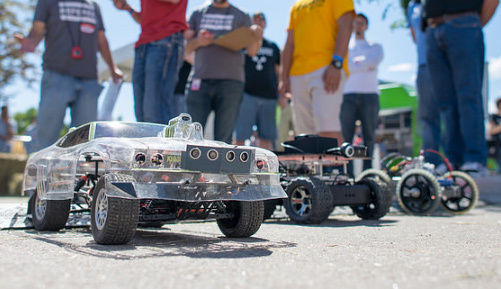 The SparkFun AVC 2017 bot and vehicle registration fee includes parking and a ticket to Denver Maker Faire for all registered team members. Any team where two-thirds of the team members are students (K–12 or undergraduate) constitutes a student team. Each student team must be affiliated with a K–12 school or institute of higher education. Student teams will be eligible for separate prizes than adult competitors. All students under the age of 18 must have a parent sign a waiver in advance of the competition. Congrats to the best and the brightest among us. Engineers are answering technical questions on our AVC forum. Sign-in required. 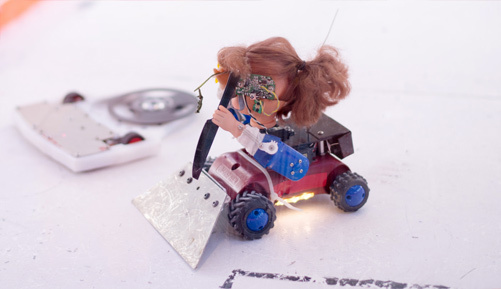 Scheduling, logistics and any other event-related questions can be directed to avc@sparkfun.com.